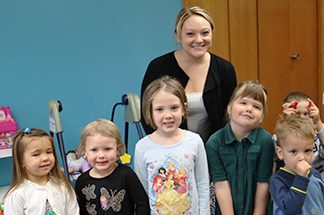 At our local church, a staffed nursery is available on Sunday mornings for children up to age six. Our nursery attendant is available to care for children during the worship services from 8:30 AM – Noon. The church nursery is located in the hallway just east of the worship center. Parents are given pagers that vibrate if their children need them during worship. Safe Haven policies are followed – a parent will be contacted if their child needs a diaper change or assistance using the bathroom during church services. Preschoolers have their own Sunday School lesson at 9:40 AM – 10:30 AM complete with Bible stories, crafts, and songs. Sunday School is located just down the hall from the nursery. Learn about King of Glory’s Safe Haven Policy here.